Hotel Overview Grand Hotel Musala Palace was built in the period 1906 - 1912 after the design of Architect Dabko Dabkov. At that time, its name was Grand Hotel London and it was one of the most beautiful buildings in Varna. Furnished to the highest standards of comfort, it was in no way inferior to the West-European hotels. Its unique appearance, preserved until today, ranks it among the distinguished architectural monuments of the city. Throughout its almost 100-year history it has been welcoming discerning business and leisure guests from all over the world. 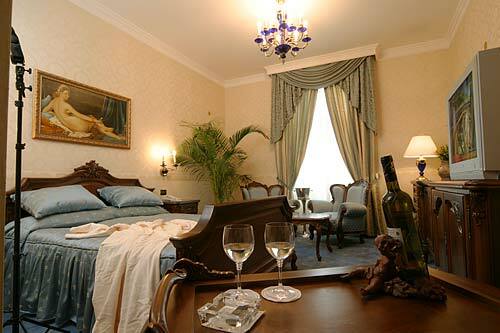 The extensively refurbished Grand Hotel Musala Palace revives the traditions of the most classic hotels. The exquisiteness of interior typical of the beginning of the 20-th century is combined gracefully with contemporary level of comfort. Facilities Hotel and room facilities of Musala Palace Hotel - point the mouse over an image to see the meaning.